This $30 pan-and-tilt camera can hold its own with the big brands. We were wowed by the original $20 Wyze Cam and its modest update, so we couldn’t wait to try out Wyze Labs take on a pan-and-tilt camera, the Wyze Cam Pan. As expected, it’s a mind-blower, delivering top-shelf features like automated scanning, motion tracking, and more for a ridiculously low $30. Much as the cube-shaped Wyze Cam broke the webcam aesthetic that many DIY security cameras are modeled on, the Wyze Cam Pan rethinks the pan-and-tilt design. Typically, these types of cameras place a ball-shaped camera module in a rotating carriage. It works, but it leaves them with a quaint retro-future look that doesn’t blend easily in most modern homes. 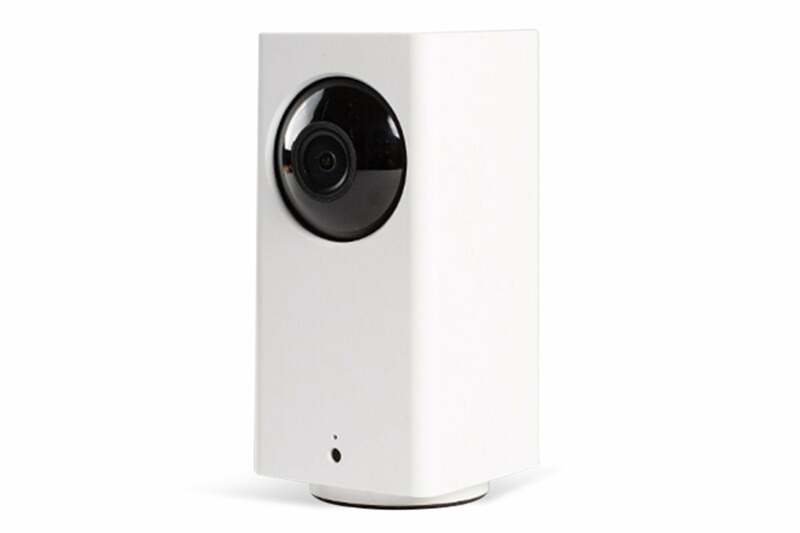 The Wyze Cam Pan keeps things simple and sleek with a white cuboid body that spins on a barely visible circular base and draws a lot less attention in a living room. 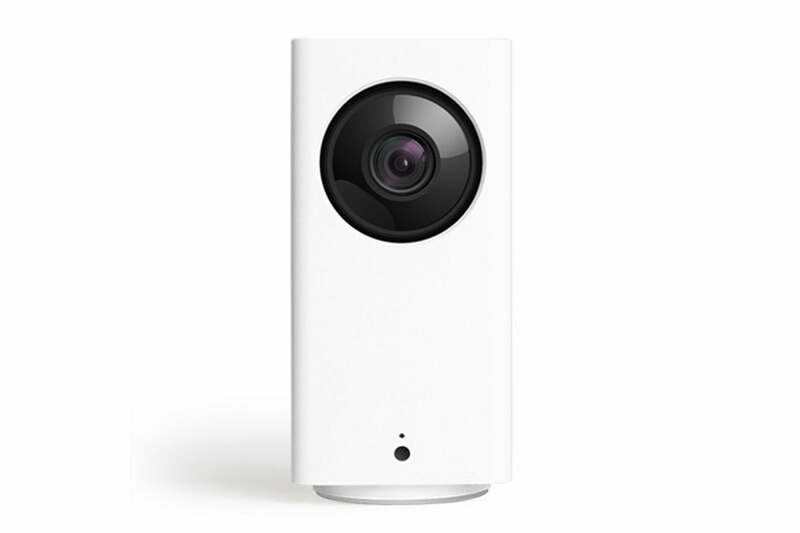 Hardware-wise the Wyze Cam Pan features a 120-degree wide-angle lens with a 3.5mm focal length, F2.3 aperture, and an 8x digital zoom. Six infrared LEDs provide up to 30-feet of night vision. It records motion-detected video in 1080p and supports both local storage via microSD card and the same free 14-days of rolling cloud storage as the original Wyze Cam. The Wyze Cam Pan rotates 360 degrees and tilts 93 degrees. 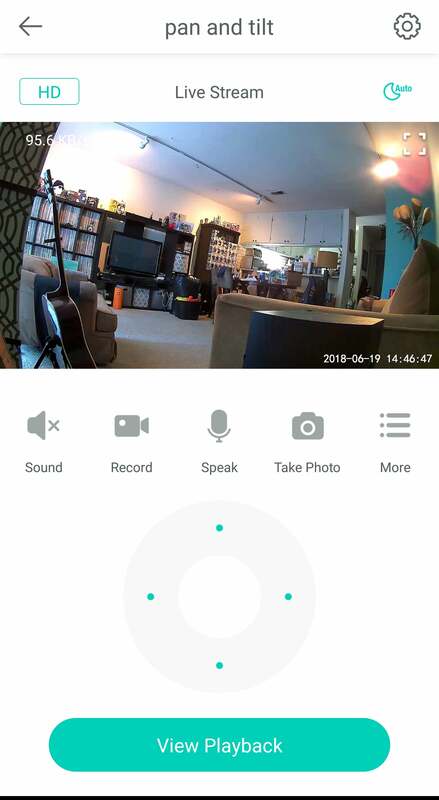 Thanks to a voice-prompt and app-guided setup, connecting the Wyze Cam Pan to my Wi-Fi was quick and painless. Once the Wyze Cam Pan is connected, it’s added to the device list of the app, and selecting it opens the camera’s live stream. 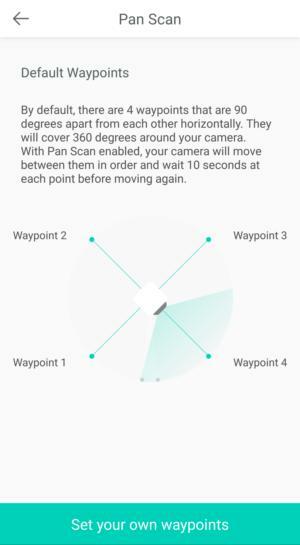 The Pan’s home screen has the same clean layout we saw with the Wyze Cam, with clearly laid out controls for recording video and taking still shots, operating the push-to-talk feature, and toggling audio on and off. The biggest difference is a control wheel for panning the camera body and tilting the lens. Pan-and-tilt cameras can be notoriously sluggish when scanning a room, something that frustrates users on the lookout for illegal activity. Wyze boasts that the Pan can turn its full 360 degrees in just three seconds thanks to a speedy-and-steady rotation speed of 110 degrees per second. That was accurate in my tests. Using the four points of the control wheel, I was able to quickly take stock of a room without any of the hesitant or imprecise movements common to a lot of pan-and-tilt camera. You can also use swiping gestures to pan or tilt (the later has a vertical range of 93 degrees) the camera when viewing the feed in full screen mode. On top of manual pan-and-tilt control, the Wyze Cam Pan offers some automated options accessible from the “more” menu on the toolbar. You can pan and tilt the camera using a control wheel or swiping gestures on the image. 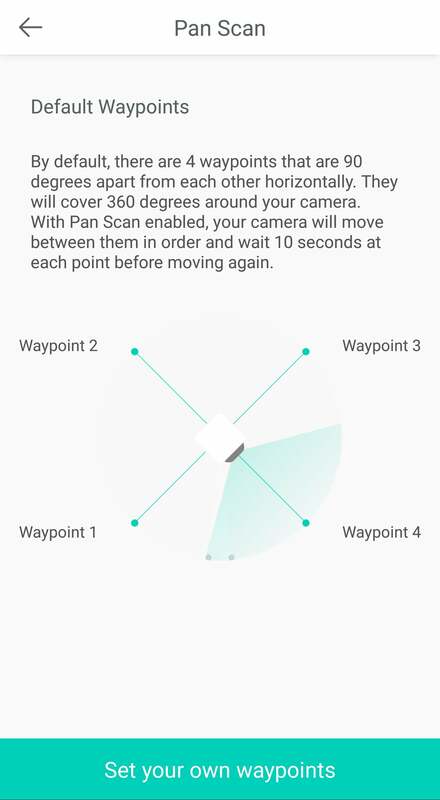 Pan Scan allows the camera to automatically scan the environment by cycling through four preset waypoints, pausing for 10 seconds at each before rotating to the next. By default, these waypoints are set 90 degrees apart for full room coverage, but you can set your own waypoints (and delete them) in the app’s advanced settings by manually panning and tilting the camera to a spot and “setting” it. When the camera’s Motion Tracking feature is turned on, the Wyze Cam Pan will follow any moving object it detects to keep it within its field of view. If the camera detects more than one object, it tends to follow the largest one. When it goes 15 seconds without detecting motion, the camera returns to the position where it first detected motion. Motion Tagging adds a green box to the object being tracked to make it more visible. The box is visible in any video recorded while this feature is enabled. Like the Wyze Cam, Wyze Cam Pan can detect motion and sound, as well as the sounds of smoke and carbon monoxide alarms. When it does, it records a 12-second video clip to the cloud where it’s available for review for 14 days. You can adjust the sensitivity of both motion and sound detection and confine motion detection to a particular area using the motion zone feature. The detection features were generally accurate with timely notifications. If you’d rather have a more complete account of the day’s events, you can record video continuously by inserting a microSD card. Wyze estimates you can capture about two days of continuous footage in HD resolution on a 32GB card and about a week of SD footage. You can conserve space, though, by turning on the time lapse feature in the app, which lets you to set start and end times and a photo-capture interval to create a daily digest. Navigating to your recorded video remains a trouble spot for me. As I discovered using the Wyze Cam, video is accessed from different spots in the app depending on how it was recorded and where it’s stored. Alert-triggered clips, which are saved to the cloud, are accessed from a horizontally scrolling calendar on the Notifications tab. Continuously recorded video stored on microSD card is displayed on its own Playback tab, where you can scrub through it on a timeline. Any video you record manually is saved to your phone and is viewed in an album you can access from the camera’s toolbar. It’s hardly intuitive and the camera’s support materials don’t do much to clear up the confusion. The Pan Scan feature automatically cycles through four custom preset waypoints. That’s an admittedly minor quibble given everything the Wyze Cam Pan does right. Its bounty of features wouldn’t matter, of course, if the camera couldn’t capture usable surveillance footage. Happily, the Wyze Cam Pan’s image quality is as sharp and well balanced as the original Wyze Cam’s. That high quality extends to night-vision mode, which produces crisp, high-contrast images on par with pricier cameras. The Wyze Cam Pan offers excellent image quality, advanced security features, and an elegant app. But its strongest selling point is value. The camera delivers performance and features you usually only find in pan-and-tilt models from marquee brands for at least three times the price. That makes it a no-brainer for security newbies and seasoned DIYers alike.